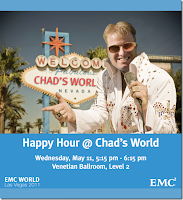 We welcome Chad Sakac (VP, VMware Alliances @ EMC) to the show, and welcome back Nick Weaver as our first The Cloudcast alumni. We start the show by talking about the uber-project that Nick's been working nights and weekends to complete for EMC World. He tells us about the vLabs, powered by a massive Cloud infrastructure (on VCE Vblocks), as well as the automation system that he wrote to manage the entire system. Next Nick and Chad tempt the demo gods by telling us the labs will run flawlessly and we debate the merits of "doing it without a net". Aaron and Chad talk about running 10k races (huh, exercise?? ), and then we dive into a discussion about what might happen for v0dgeball 2011 at VMworld. We discussed the combination of skydiving, v0dgeball and and a massive game of BlackOps, all together. 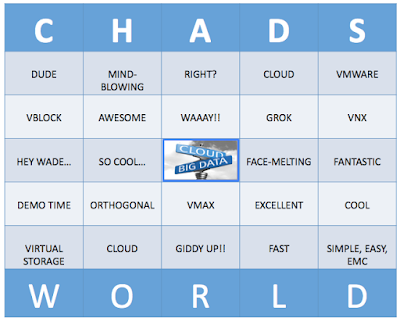 Chad gives us a few hints about what we can expect to see from the keynotes at EMC World, including some game-changing announcements from Pat Gelsinger and Paul Maritz (VMware). We then reveal to Chad that the actual intent of this show is an intervention about where Chad's World is going. We express concern about it turning into a giant beer commercial and question the lack of beer commercial babes vs. having Wade on the show. He's insulting the sponsor, which is never a good idea. We then give him our list of improvements to make it competitive with other shows in Las Vegas. [Editor's Note: How do you know when your 15 minutes of fame is getting close to the end, or when you've officially jumped the shark? We're not making any judgements, but having your own bobblehead might be the first sign of that? Contest between Chad & Wade to see who does a better Joe Tucci impression. Charity auction with the audience, where the winner gets to wear the vSpecialist Gorilla suit at VMworld and be an honorary vSpecialist for a day. And last but not least, the audience can play the "Chad's World Drinking Game", using the card below. 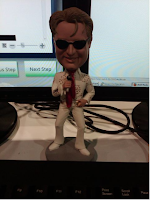 To end the show, we created some controversy that attendees of EMC World need to watch out for. You'll have to listen to the show to find out the details.